He added that his father was alive and well. What this incident reveals is that psychological operations are very real. The media barrage about Saif al-Islam’s alleged capture was designed to demoralize the Libyan’s defending their country from imperialist attack and occupation. Saif al-Islam is Gaddafi’s heir apparent. He is also an important military commander in the defense of Libya, and Tripoli. This media barrage about his false capture is similar to many media blitzes claiming Gaddafi or his sons had fled Libya or been killed. 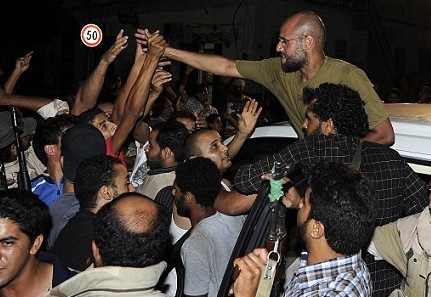 In his appearance, Saif al-Islam corroborated what had been reported this week by Russia Today reporters in Tripoli. Saif al-Islam echoed reports that Western reporters on the ground were working hand-in-hand with NATO intelligence agencies. This is no surprise. The false news barrage was designed to cause chaos in the chain of command of the Gaddafi’s forces, especially in Tripoli, and encourage surrender to NATO. The attack on Tripoli was highly coordinated. Even the mainstream media is reporting that the defeat of Tripoli was closely planned by NATO. It was reported in the British press today that MI6 had been directing the rebels for months, they also planned the attack on Tripoil. The news barrage occurred as NATO bombed a corridor into Tripoli, followed by NATO-backed “rebels” and NATO advisers entering the city. The NATO forces were reportedly able to push their way to Green Square, an important symbol of the Gaddafi regime. British “peace keepers” are reportedly standing by in Cyprus, ready to be deployed “if needed.” However, the NATO forces are now reported to be on the defensive. Gaddafi loyalists still have military capacity to launch attacks across Tripoli, according to reports. They may not have enough to turn the tide against NATO’s overwhelming onslaught. Saif al-Islam defiantly gave a “V” for victory sign to spontaneous crowds that had gathered to support the battle ahead against NATO. In all of this, sharp lines have been drawn within the so-called “left.” On one side, there are those who stood against the NATO-backed aggression. On the other, there are those who stood with NATO, those who became shills for the CIA and MI6, those whose main role was to try to legitimate the imperialist narrative and undermine the anti-interventionist, anti-imperialist, and anti-war movements in the First World. Not everyone who calls themselves a revolutionary is a revolutionary. There is a reason that — over and over — some forces calling themselves radical, revolutionary, socialist, communist or anarchist line up with imperialism. These forces lack real science. They do not understand global class dynamics. They do not understand the principal contradiction between the First World and Third World. They do not understand the broad united front against imperialism. They are thoroughly unscientific. By contrast, the Leading Light has consistently stood with the Third World against the First World. The Leading Light stands against imperialism everywhere. Gaddafi’s fall will only lead to an increase of imperialist hegemony in Africa and the Arab worlds. All genuine revolutionaries stand against imperialist attacks against Libya, Syria, Iraq, Afghanistan, Pakistan, and Iran. Follow the Leading Light to victory over imperialism! Follow the Leading Light of genuine communism! “Sophie’s choice” in Africa and the world: which child dies under capitalism? The ‘rebels’ were able to enter Gaddafi’s compound with the help of NATO bombing. Just like all their ‘victories’,-NATO bombs the hell out of a target then the ‘rebels’ wander in and pat themselves on the back for their courage. Tonight nationalist forces are counter-attacking against the ‘rebels’ wandering around the compound and the anti-social elements that came there to loot. The CNN blog has been more objective over the last two days. Sky News was reporting that all Gaddafi’s remaining supporters were in the compound. CNN reported that they still control the East of Tripoli and had launched a counter-attack around the airport. Don’t be surprised if someone notices whoever is doing the blog is not ‘on message’ and the content changes. A Russian TV reporter in the Rixos said they received a death threat from a CIA Agent for their ‘off message’ reporting so there is obviously a concerted effort to get the media ‘on-side’. I believe there will be long-term resistance in Libya. If you look at Iraq, Saddam had a narrower base of support than Gaddafi but resistance continues to this day. The resistance was undermined here by the fanatical behaviour of Al-Qaeda which forced former Baathist loyalists into the hands of US imperialism with the ‘Awakening’. Luckily Al-Qaeda is on the other side this time! This is an amazing article. A great Red Salute to its author! Comrade Joseph, thank you for your comment and the information provided. However, there is some incorrectness in your last paragraph; you mentioned Al-Qaeda, but Al-Qaeda as an organization has never existed. Al-Qaeda is the name of a computer database used in Afghanistan during the Soviet invasion. Thanks again for your comment, Red Salute! I don’t understand comrade. What I have learned makes up “al-Qaeda” is a loose conglomeration of militant cells that oppose imperialism in Afghanistan, Pakistan, and other Middle Eastern countries. Do you think that these cells do not exist? Are there not militants in these countries that refer to themselves as al-Qaeda? I’ve never understood the reasoning behind denying al-Qaeda’s existence. Could you clear it up for me? Google search only provides me with conspiracy theories and Alex Jones’ stupid website. Perhaps there are loose anti-imperialist militant cells that refer to themselves as Al-Qaeda now, but the supposedly large and powerful organization called Al-Qaeda (literally “The Database”) does not exist. , who was a British MP and Foreign Secretary for a time, has mentioned that it is a fabrication. Even reactionaries like Ron Paul are willing to accept this. Now that I think about it, though, it is possible that the militants decided to use the name “Al-Qaeda” to form the organization as an ironic show of spite towards the imperialists, who used the database to communicate with the mujahadeen during the Soviet invasion. It isn’t relevant in the big picture anyway; it doesn’t change the fact that imperialism is what it is.